A drop forged carbon steel tool with vinyl grips; it pulls staples, twists wire, cuts wire and hammer too; this multi-purpose tool will help you properly maintain your electric fence. Made of nickel chromium steel for overall strength and durability. Used to work on metal and wood posts. ProTouch grips provide extra comfort for less hand fatigue. For wood and steel posts on ranch or farm. Heavy duty lock joint construction with oval faced jaws. Start and pull point on one jaw with corrugated hammer head on the other. Pulls staples and splices wire stretcher behind joint. Solid drop forged carbon steel blades. Heat treated, milled face design. Non-slip coated green handles. 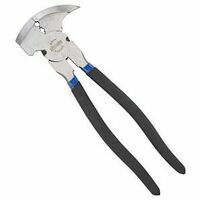 Made of forged alloy tool steel with polished head, 2 electronically induction hardened durable wire cutters, 2 staple grips in nose, and corrugated hammer head, heavy prong. Special opening in head allows both wire and staple to be gripped. Jaw type is dual head, edge type is standard; cut capacity is 11 AWG. Red non-slip cushion handle grips. Hammer strike face; staple starter and puller; wire stretcher and splicer; two wire cutters; Chrome vanadium steel for strength and durability; bi-material cushion handle for strong grip and comfort. Made of high-carbon steel. Hammer on jaw, staple starter and puller and wire stretcher, splicers and 2 cutters. Channellock Blue grips for comfort. Made in USA.